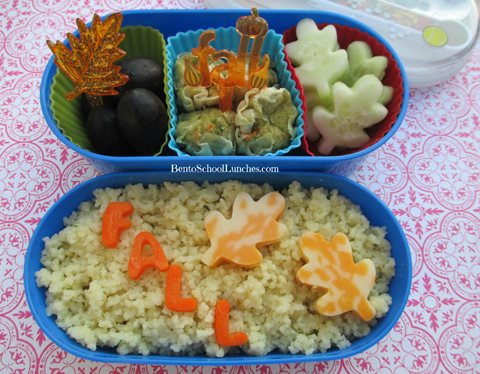 It just doesn't feel like fall here in FL but it has been a little bit cooler today and this is my first fall bento. The chicken shu mai is from Trader Joe's and they just required heating, I usually steam them in my mini microwave steamer but you can also heat them in a microwave safe dish, super easy. It took me 7 minutes to cook the couscous on the stove and N loves couscous a lot lately. Top tier contains seedless black grapes, chicken shu mai and leaf shaped cucumber slices. Bottom tier contains couscous with carrot lettering and leaf shaped colby jack cheese. 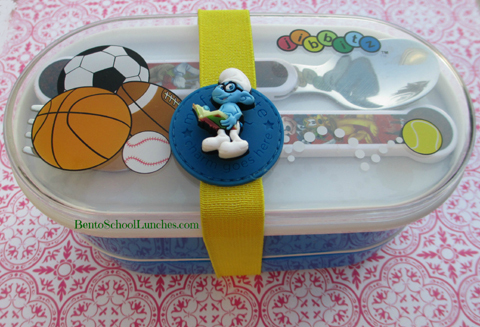 Packed in a double tier lunch box that I purchased from Crocs shoe store couple of years ago. Wow, this is so beautiful Rina!! I'd like to sit down to this little bento lunch myself!! Chicken shu mai sounds so so awesome and with yummy couscous... oh yes please!! Love this lunch.. can't beat couscous and a fall theme in my book!